Print Fusing: 101 — 3D Gloop! 3D Gloop! 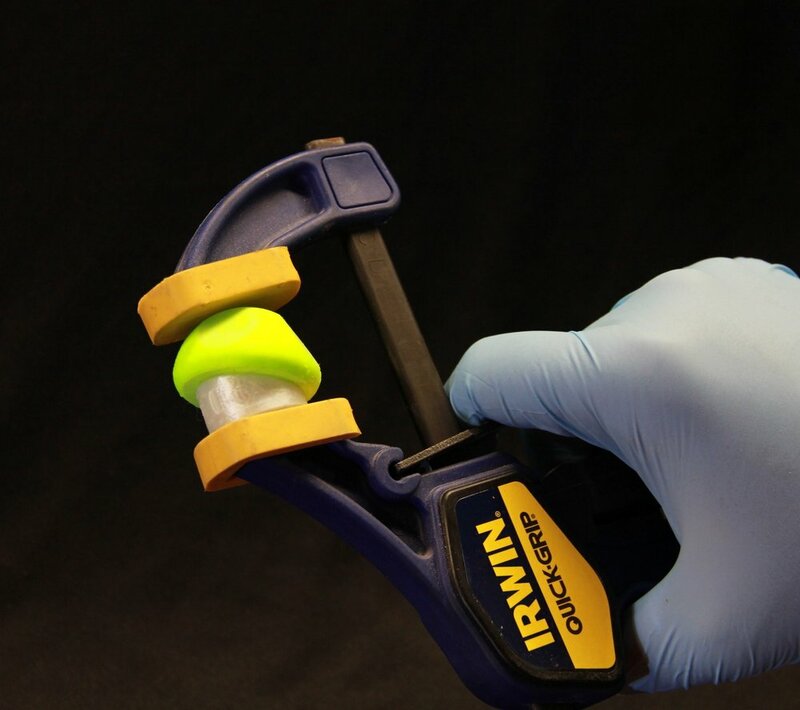 Is specially formulated to quickly create the strongest bond between printed parts possible! Super glues, epoxies, and other adhesives are no match for 3D Gloop! For same plastics (ABS to ABS, PLA to PLA, etc). Follow the guide blow! Step 1! - Prep Yo Parts! For the strongest bond possible, we recommend you gently sand the bonding surfaces of your prints with 100-grit or coarser sand paper. While sanding is not completely necessary, the rough surfaces ensuring 3D Gloop! can adequately penetrate into the plastic and "wet" the surface. Sanding also ensures the two surfaces are uniform and mate together as flat as possible! Step 2! - Gloop! it up!!! Alright! Here is the fun part! Each formulation of 3D Gloop! works best for a specific family of plastic so grab the respective Gloop! for your plastic and open the container! If you are using the syringe applicator, remove the cap! Use caution as the container may have become pressurized since last use! Begin to apply a thin layer of the Gloop! To all faces of the parts you want to bond together. If you're using a brush, make sure to evenly spread a thin coating over each mating surface. Those using the syringe, gently depress the plunger despising Gloop! in a targeted area. - Don't try to cover large areas with Glue Gloop! It's designed for precise application! HELPFUL TIP! : Be generous with the Gloop! but don't over do it... A little can go a long way. Even coverage is important! IMPORTANT NOTE! : If you chose not to sand your surfaces, it is a good idea to apply a little bit more Gloop! to ensure good penetration into the plastic surfaces! Step 3! - Give'em The Clamps Boss. Using the clamps robot god gave you for hands firmly press together the Gloop! 'ed mating surfaces. - Or you know, you can use actual clamps... Don't get Gloop! on your bare hands! 3D Gloop! forms medium tack bonds within seconds of the bonding surfaces mating. Should you have miss-aligned your part you have a few short seconds to position it properly before the Gloop! begins to cure. 3D Gloop! cures to a strong tack within 15 minutes, however, we recommend waiting at least 30 minutes for a complete strength cure. Gentle heating will speed the cure time of 3D Gloop! Glue times will vary so when in doubt, give it more time! IMPORTANT NOTE! : When mating Gloop! 'ed surfaces, it is important to understand that some squeeze out will happen. It's no worry as clean up is very simple! To clean up Gloop! ooze, we recommend using a cotton swab, paper towel, or foam sponge to wipe up any of the unwanted ooze around mated joint. Once done, simply discard the clean up utensils. Remember, they have Gloop! on them, you don't want cotton swabs stuck to your prints! Whoo Hoo! That's it! - Pretty simple right? So go out there and fuse everything together! For unlike plastics (ABS to PLA) special instructions are below! Alright we know, We've all been there before... We ran out of filament during a multi part print and all we've got left is something other than what we printed the rest of the project out of. Fantastic! - Not. Or perhaps you have a specific application that requires the wear resistance and strength from ABS for a given area, yet at the same time you also require stiffness and favor form over function that PLA provides in another? Well then, how in the heck to do you bond these two plastics together ensuring a strong bond that wont fail? 3D Gloop! has got your back pal! And again we're here to tell ya, its dang simple to do too! If you haven't read through the steps for bonding same plastics we really suggest you go do that now. Knowledge is power! If you have, well then great! If not, well quit being lazy! Unlike same plastic bonding, for unlike plastic bonding Step 1 isn't really an option... So sand you parts with coarse sand paper. 60 or 80 grit is preferred! Be aggressive. Channel you're inner gorilla and put some deep groves into the surfaces you wish to bond together. IMPORTANT NOTE! : If you haven't already printed your parts, our scientists really recommend that the bonding surfaces each have 3 solid walls or 6 solid layers (about 1.2mm in thickness) for functional applications. For non functional, 2 solid walls or 4 solid layers should suffice. Just like in same plastic bonding instructions, unlike plastic bonding relies on the science built into each formulation of 3D Gloop! Formulations are specific to plastic families and work their best when paired together correctly. For unlike plastic bonding, it is important that the appropriate Gloop! be applied to the respective bonding surface. Simply put: ABS Gloop! on an ABS print and PLA on a PLA print. Use similar application techniques as mentioned in the same plastic bonding instructions. HELPFUL TIP! : If your goal is to bond a smaller piece of plastic to a larger piece, it is okay to apply the appropriate Gloop! of the larger piece only to the smaller pieces bonding surface before bonding. This may result in a weaker bond but may ease application. IMPORTANT NOTE! : Miss-matched Gloop application as noted in the helpful tip will result in functional bonds. While it is not recommend, ABS Gloop! can be used to bond PLA prints and vise-versa. Bonding strength is negatively affected but that impact reduces with larger bonding surfaces. Alright, you read the same plastics fusing instructions right? Right? Well lucky you, this step is no different! Clamp up your part and let the bond sit for about 30 minutes. See... Wasn't so hard! Happy Printing!